CJC 1295 without dac (synonym CJC 1295 w/o dac-complex, modified form GRF 1-29 without DAC-complex) belongs to peptides hormones and contains 29 amino acids; As well it is quite stable analog of growth hormone releasing hormone with D-Ala, Gln, Ala and Leu substitutions in certain positions - 2, 8, 18, 27, and in a such way it is enhance this protein's biological activity. Its molecular formula is C152H252N44O42 and its molecular mass is 3367.97. The biggest proven advantage of CJC 1295W/o dac is that it can biologically conjugate with albumin's serum which has impact on its effective half-life period and therapeutic range. Moreover this synthetic drug of proteins' class can effectively stimulate the pituitary gland therefore making them to produce larger amount of hormone of growth. 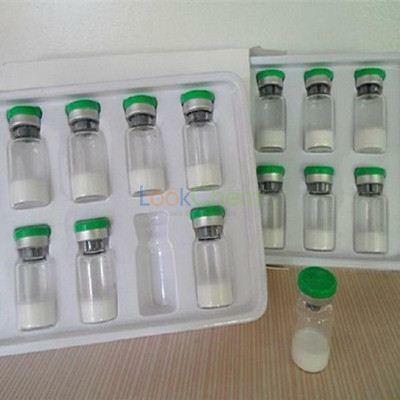 The main characteristic of this research compound is increasing peptides synthesis which causes rapid growth of muscles. CJC1295 DAC has shown some amazing results as a hormone releasing hormone (GHRH) analog. Not onlyhas CJC1295 shown the ability to increase hormone and secretion and its benefits, but it has been able to do so in very large amounts. Recent research studies have shown that CJC - 1295 stimulates GH and Secretion, and will keep a steady increase with no increase in prolactin, leading to intense fat loss, and increases protein synthesis. CJC-1295 DAC is a long acting Hormone Releasing Hormone, which causes the anterior pituitary to release more hormone. The objective of the peptide was to treat visceral fat deposits in obese AIDS patients, as increased levels of exogenous are presumed to increase lipolysis (fat loss). The clinical research was ultimately successful for most research subjects. Ghrelin, released from the gut, which circulates and acts as a hunger hormone, has synergistic activity in the body with GHRH and also suppresses somatostatin to make way for the GHRH pulse. An example of a GHRP (GH Releasing Peptide) is Hexarelin or GHRP2. CJC 1295 DAC is a exceptionally designed peptide and is known for being the finest of the secretogues. 1.Supports GH secretion 2-10 times!